There's a crime wave in Japan. The victims are famous and beloved, but helpless and unable to fend for themselves. They're being violated and damaged. It begs the questions: If they are so beloved, why is this happening? 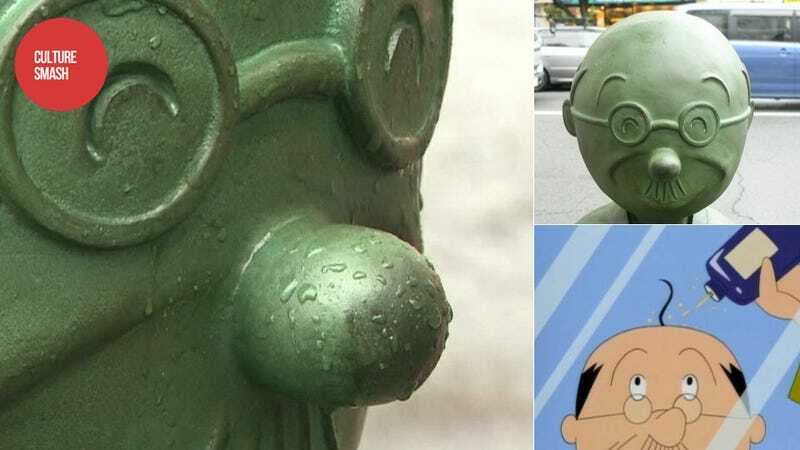 This week, another Japanese statue of a famed anime character was defaced: Namihei Isono, the father of the iconic Sazae-san. The vandals made their point by taking something very important: the sole hair on Naimhei's head. Bastards. As The Mainichi pointed out, Sazae-san is perhaps the most beloved manga and anime in Japan. Every Sunday evening when it airs, families gather around the television to watch it. This is why bronze statues of the Sazae-san characters are located in Tokyo's Setagaya Ward where manga's author Machiko Hasegawa lived. This year, 12 Sazae-san bronze statues were erected in Setagaya to mark the manga's 65th anniversary. Namihei, the father in Sazae-san, sports a trademark strand of hair on his baldhead—ditto for the statue. But on May 7, SOME JERK yanked the 10cm hard wire from the bronze Namihei's head, leaving the character nearly bald. According to The Mainichi, a new strand was attached, but on May 20, SOME JERK pulled it again. This comes as bronze statues of the character Conan were damaged, making this a trend of sorts. A cruel, awful one. Stop the anime bronze character violance. Please, I beg you. Hey You Jerks! Leave this Anime Character Alone.